When I hear the name Marcus Lattimore there are three things that immediately come to mind. The first thing I think of is what amazing character he has and how great he has been as an ambassador for the University of South Carolina and the game of football. Marcus continuously thanks God for his talent and his accomplishments on and off the field and is always the first to say he could not do what he does or has done without his faith and the help and support of his teammates, coaches and family. He has always been one to do his part in the community and reach out to the kids who love the sport and look to him as a role model. The second thing, would of course be, what an incredible athlete and football player he is. 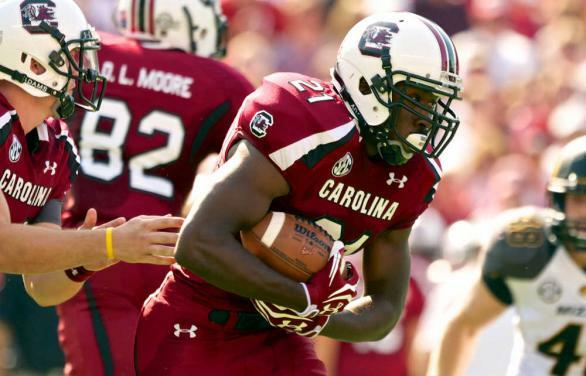 At this time in my life I cannot think of any other Gamecock football player I enjoyed watching play the game more than Marcus Lattimore. Just the love and passion for the game that he brought to the field every Saturday is undeniable. He would carry the ball 100 times a game if asked to and wouldn’t think twice about it, whatever it took to get the job done and come away with the victory. The greatest memory I have of Marcus would be the 2010 game against Florida in “The Swamp”. He carried the ball 40 times for 212 and 3 touchdowns, single-handily torching the Gator defense. If you were to ask him about this game, I would be willing to bet any amount of money that he would thank his teammates and coaches for preparing him for the opportunity. Lastly, after all the incredible accomplishments on the field in a Gamecock uniform I cannot help but think, what could have been? Marcus was sidelined for twelve and a half games in his three year college career due to injury. I will forever be grateful for everything Marcus has done and given to the program and fans of South Carolina. As fans, we will never forget that scary moment in the Georgia dome when he lay lifeless on the turf and had to be taken to the hospital for a jaw injury and concussion or the first ACL tear against Mississippi State and the gruesome moment last season against Tennessee. Watching that Tennessee game, I do not believe any of us could believe our eyes of what had just happened, I can remember to this day how empty I felt at that time and I am sure many of you felt the same way. It was like watching a family member or brother for that matter being carted off the field. At that time I knew in my heart I had seen the greatest running back in Carolina history carry the ball for the last time in a Gamecock uniform, as my eyes began to haze. I do not take anything for granted that he gave to all of us as fans, but cannot help to wonder if none if this would have happened, what could have been? With a record setting career, with 41 touchdowns at South Carolina to go along with 2,677 yards on 555 carries for 4.8 yards a carry it’s hard to imagine anyone not being happy with these type of numbers and of course as fans all of us are perfectly fine with this. A very productive career for someone who spent 12 plus games injured. Marcus averaged nearly 112 yards a game in his career as well. If we tally his yards per game total into the games he missed, plus his senior season, assuming he would have returned, he could have easily rushed for somewhere around 4,100, which would be good enough for sixth all time in SEC career rushing yards right behind Bo Jackson (4,303) and Errict Rhett (4,163). It may be safe to say, barring injury and being completely staying healthy his entire career he would have broke the touchdown record for running backs in the SEC, which I believe is held at 57 by the great Florida Gator, Tim Tebow. It may be selfish to ask this question “What could have been?” after all Marcus has done for us as fans and supporters of Gamecock athletics, but it’s hard not think about as a fan wanting to see Marcus succeed on every level on the field and off. Now that he has done all that he could do for us on the field, Marcus is the type of player that will keep coming back and keep showing his love and support for the University of South Carolina. We may not ever see him on the field at “The Brice” again, but as fans there will always be a memory of 21 carrying the ball on Saturdays. Now that he has begun fulfilling his dream of playing in the NFL, all of us from blockcblog.com would like to wish Marcus the best of luck and look forward to seeing him on Sunday’s. Any NFL franchise will be lucky to have someone like Marcus Lattiomore to represent their organization on and off the field, being the ultimate competitor on the field and the best person he can be off the field.